Laminate floor installation is very popular, particularly with DIY homeowners. To install it, you do not need to have much knowledge and skills, and yet, this work contains some of the secrets, which I will gladly share in this article. I have written repeatedly about the importance of leveling for your floor. Any floor is better and easier to install if you have a good leveling. 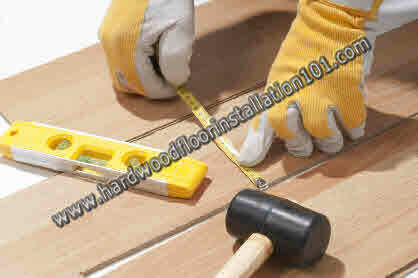 A good leveling is especially important when you are doing laminate installation. There are several reasons. First of all, laminate is artificial material. It is lightweight and flexible. Each board has its special locks, with which it is connected (snapped) to the other piece of laminate. If you have never installed this floor, but you see how low the cost of material is, do not rush to buy it. You should know that the lower the cost of the material, the less strong the locks are on its boards and during laminate floor installation, they often break down. In this case, you have to spend extra time on installation, and buy more material. It inconveniences installers and makes a project more expensive. Very often, homeowners have to pay for the builder’s mistakes and are surprised with the sum of money they have to invest in leveling. As a rule, homeowners do not think about a good leveling as a good investment, because it is hidden from their eyes, and they prefer to pay more money for what will be seen on the surface – for material. Most of all, for their carelessness, they have to pay twice in the future. In this article, I mentioned that laminate, or rather the locks on its boards, are very sensitive. Typically laminate flooring is installed as a floating floor. It means that it is not attached to subfloor by glue or nails and is constantly “float”. In order for it to move freely floor installers always leave some gaps by the walls – up to 1 / 2 inch. So, if you are prepared a bad floor leveling for your floating floor and leaved on your subfloor some pits and bumps, then you’ll have to do your laminate floor installation again and very soon. This is especially true with high traffic locations – hallways, kitchen, living room and room for kids. The most “naughty” place in the office is under your chair, as well as space for the chairs in the dining room. If you still want to install the cheapest laminate and do not want to spend too much money on subfloor’s alignment, then you can set your material on the glue. Doing laminate floor installation by glue down may even be much cheaper than installing it as a floating floor, but note that you must have certain skills for this method. 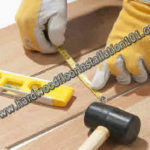 On hardwoodfloorinstallation101.com you can find lots of useful tips on laminate floor installation, subfloor leveling and other important info. If you listen to my advice and do your leveling smooth as a mirror, your laminate floor installation will bring you a longer service than carpet.